The New England Patriots are now playing in their seventh-consecutive AFC Championship Game. This is a pretty clear indicator that the Brady/Belichick Pats have entered an area of absurd postseason stats. Let’s examine more deeply. 1) Yes, the Pats are now playing in a record 7th-consecutive conference-championship game (and 12th in 17 seasons). If you recall, Brady lost his first two playoff games after returning from his 2008 injury. After he lost a Wild-Card Game to Joe Flacco’s Ravens and a Divisional Game (post-bye) to Mark Sanchez’s Jets, many people started to doubt the Pats’ status as a postseason force. Since then, the Pats have reeled off seven-straight conference-championship-game berths. So much for that doubt. 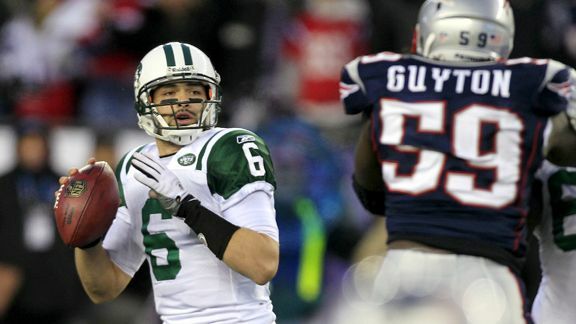 Meanwhile, Mark Sanchez remains the only QB to beat the Brady/Belichick Pats with the Pats coming off a bye. 2) The Pats are 3-3 in these six consecutive conference championships (0-2 in Denver, 1-1 at home against Baltimore, 1-0 at home against Indy, and 1-0 at home against Pittsburgh). Game 7 happens this Sunday against Jacksonville. While any cliche hockey announcer might love to say that “anything can happen in a Game 7”, I have trouble believing that these Pats could lose to Blake Bortles’s Jags, with all due respect to Blake’s decent game on Sunday in Pittsburgh. 3) The Brady/Belichick Pats are 26-9 in the postseason. This is absurdly ridiculously incredibly incredible. A win this Sunday against the Jags would put the Pats at 27-9, good for a .750 winning percentage. This percentage would mean that the Pats are playing at the same clip as a 12-4 team….playing at this pace over their entire playoff experience! Usually, teams get to 12-4 in part by beating up on some cupcakes on the schedule. In the playoffs, this is not the case. Playoff teams are almost always good. This leads me to Stat #4. 4) The Brady/Belichick Pats have played exactly three games in the Wild-Card Round. While that stat might not be incredible for most teams, it is amazing for a team who has been in the playoffs 15 of the past 17 seasons. Of course, the Pats have managed to earn 12 byes of those 17 seasons, so I think you can handle the math on that one. That said, Wild-Card-Round games are usually good chances for good teams to pad their playoff win totals. After all, the worst playoff teams usually get knocked out in this round. No shock there. In fact, Peyton Manning’s playoff record was hurt by the fact that he too rarely got to play in the Wild-Card Round. One might expect that Brady’s playoff record would be hurt by this too, but somehow he has been just fine. Meanwhile, only 3 of the Pats’ 26 postseason wins in this era are ones against teams I consider pushover opponents – the 2011* Tebow Broncos, the 2016 Texans, and the 2017 Titans – all wins at Foxboro in the Divisional Round. 5) Thus, who have been the Pats’ opponents in their 26 wins? Here is the definitive list. 6) Remember after Flacco’s and the Ravens’ second playoff win at Foxboro (2012 Season’s AFC Championship Game) when everyone started saying that the Pats aren’t that tough in Foxboro? Yeah, about that….the Brady/Belichick Pats are actually 18-3 at home in the playoffs. Wow. If your name is neither “Flacco” nor “Sanchez”, then you are not a QB who has won a playoff game in Foxboro this millennium. 7) Thus, the Brady/Belichick Pats began 8-0 in the playoffs at home and are currently on a 7-0 run in the playoffs at home. Between those two stretches, the Pats had a 3-3 stretch in playoff home games. Thus, a Pats win against Jacksonville on Sunday would put the Pats on another 8-0 streak and provide symmetry to their home playoff performances. 8) The Brady/Belichick Patriots are 5-2 in Super Bowls. Most people know that. Most people also know the delightful fact that the New York Giants are the only team to beat the Brady/Belichick stats in the Super Bowl….and they did it twice. Let us never forget this glorious fact. 9) Speaking of which, the last time the Patriots won a road** playoff game, most football fans had never even heard of David Tyree….and the iPhone had not yet been released. The Pats’ last road playoff win came in San Diego in the playoffs of the 2006 season. In this win, the Pats took down a dominant 14-2 Chargers team. 10) In fact, the Pats have only 3 road playoff wins in this era – the two AFC-Championship wins in Pittsburgh (2001 and 2004 seasons) and this San Diego game. Granted, while this number of 3 road wins might seem paltry, keep in mind that these Pats have played only 7 road playoff games among their 29 non-Super-Bowl playoff games (including the game this coming Sunday). All 4 of the Pats’ road playoff losses fall inside the Venn Diagram of “Losses in Denver” and “Losses against Peyton Manning”. Two of these losses are in the overlap region (the 2013 and 2015 AFC Championship Games). One was the loss in the 2006 AFC Championship Game in Indy, when Peyton led an 18-point comeback. Of course, the other loss came in the 2005 AFC Divisional Round at Jake Plummer’s Broncos. I should note that, in all 15 of these Pats’ 17 playoff seasons, New England has won the AFC East and thus started the playoffs with a home game (either in the Wild-Card Round or Divisional Round), hence greatly decreasing the number of opportunities for the Pats to have road playoff games. 11) As a result, these Pats have played in as many Super Bowls as road playoff games (7 to 7, with a chance for Super Bowls to increase to 8 on Sunday). Furthermore, these Pats have two more Super Bowl wins (5) than road playoff wins (3). Wow. *When I say “2011 Tebow Broncos”, I mean the Broncos of the 2011 season, although the playoffs took place in 2012. I use that same method of labeling seasons throughout the post. **Super Bowls are considered neutral-site games, not road games. What If the Kerrigan/Harding Incident Happened Today? Do NBA Fans Enjoy Participation Trophies?